It's an exploration of the funk universe on American Routes. New York City's pioneer of Afro-Latin Soul, Joe Bataan, tells us about his boogaloo beginnings, melding latin beats with soulful sounds and his move toward "salsoul" and rap. And a conversation with Stanton Moore and Ben Ellman from New Orleans' Galactic about their love of all things funky from the Crescent City and beyond. It's an exploration of the funk universe on American Routes. New York City pioneer of Afro-Latin Soul, Joe Bataan, tells us about his boogaloo beginnings, melding latin beats with soulful sounds and his move toward "salsoul" and rap. 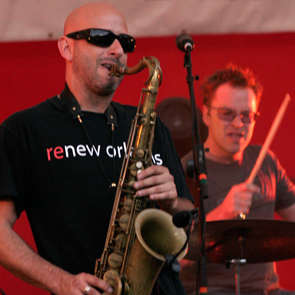 And a conversation with Stanton Moore and Ben Ellman from New Orleans' Galactic about their love of all things funky from the Crescent City and beyond.